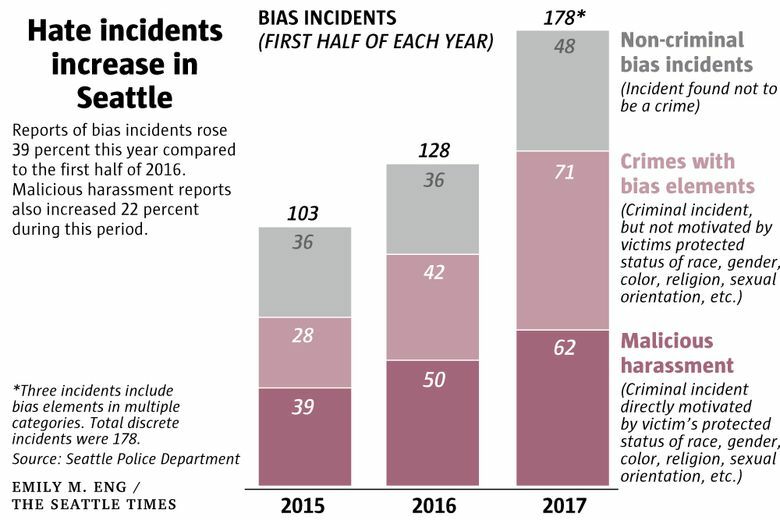 The Seattle Police Department counted 178 reports of bias incidents, including 62 reports of malicious harassment, during the first half of 2017. 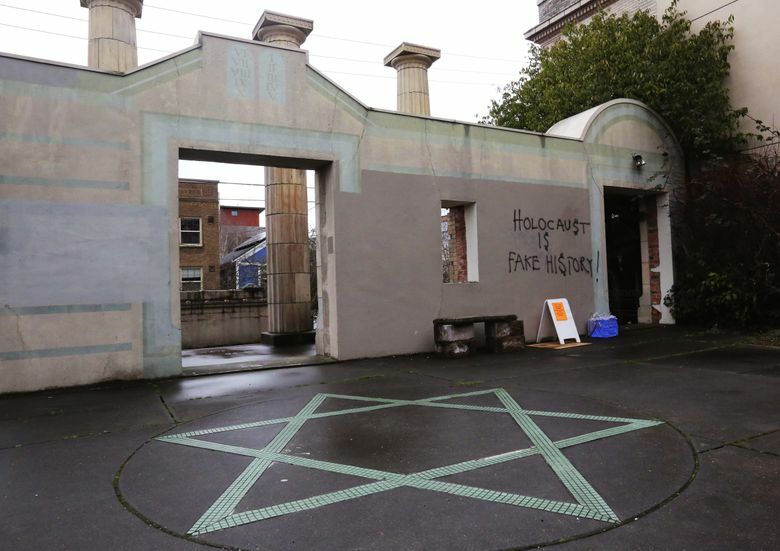 Reports of hate crimes have continued their steady rise in Seattle, according to a tally of bias incidents through the first six months of this year from Seattle police. During that period, the Seattle Police Department (SPD) counted 178 reports of bias incidents, including 62 of malicious harassment. That compares to 128 bias incidents during the first half of 2016, 50 of which were malicious harassment. 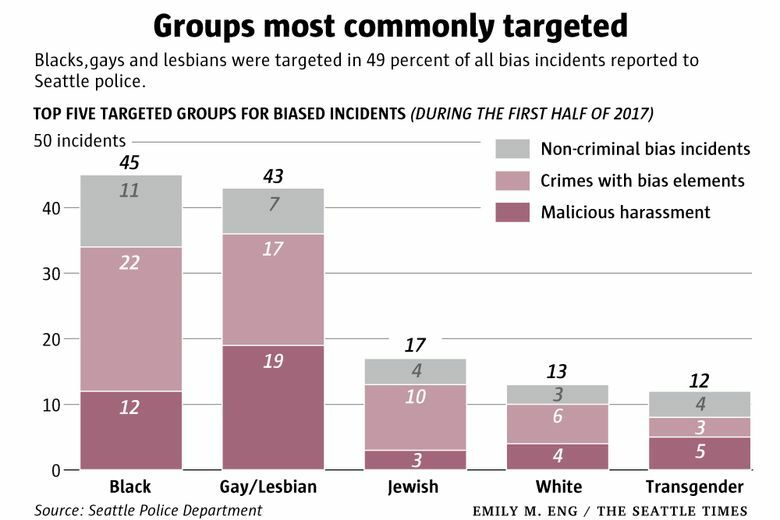 The groups most commonly the targets of bias in the first half of this year were blacks, gays and lesbians and Jews, according to police. In Seattle, a misdemeanor malicious-harassment law extends those protections to include gender identity, homelessness, marital status, political ideology, age and parental status. Seattle police also track crimes with a bias element, in which hatred toward a protected group or class is a secondary motivation, and bias incidents, which aren’t crimes. Bias incidents often involve hateful speech against a protected class that is free speech and protected by the First Amendment. 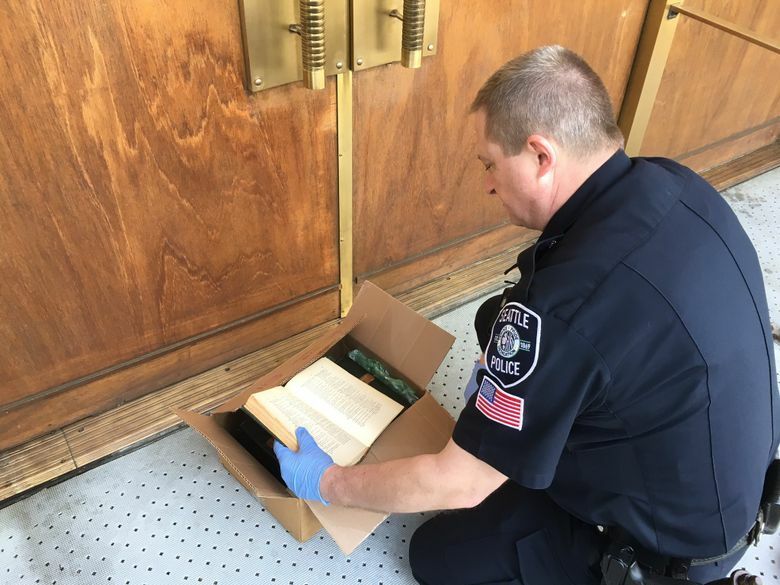 Detective Beth Wareing, who coordinates the department’s response to bias crimes, said she has seen an uptick in reports from people who witnessed bias crimes but were not targeted themselves. “People are aware, people are concerned. I like that about Seattle. People are paying attention here,” she said. She has also fielded an increasing number of requests from community groups asking her to speak about how to handle bias crimes and de-escalate confrontation. The rise in SPD’s count of bias incidents could be an indication bias crimes are more prevalent, but it could also be that people are more aware or are more willing to report it, Wareing said. Wareing said she would like to expand outreach efforts to Spanish-speaking, transgender and homeless communities, because she believes those groups might have barriers to reporting bias. Wareing said a group of Spanish-speaking men were the targets of a bias crime earlier this year. They were attacked but did not fight back, she said, because they feared being seen as suspects and blamed for the violence. “When you look at the narrative nationwide, I can see why they’re worried,” she said, adding that she’s concerned some people avoid reporting crimes against them because of their immigration status. “If people have any doubts about it, they might not call … we don’t ask that question in the city of Seattle,” she said, referring to someone’s immigration status. Wareing will present the department’s report on bias crimes at a City Council committee meeting Wednesday morning. Also, Councilmember Lisa Herbold last spring requested the city auditor examine how Seattle handles hate crimes. Results of that audit are expected within weeks.